The Save the Rain program recently completed renovations on the first green gateway project in the City of Syracuse. Save the Rain gateway projects are intended to highlight the use of green infrastructure at key entry points in the City. 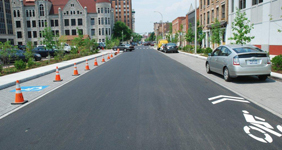 The Water Street project includes a comprehensive streetscape design along the 300 block of East Water Street between South Warren Street and Erie Boulevard. 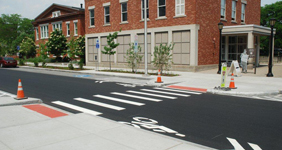 Project features include enhanced tree plantings; the use of porous pavers in the parking lanes on either side of the street; infiltration trenches and planters along the sidewalk; and enhanced landscaping features along the corridor. The finished project produced a dramatic transformation to the streetscape and gave the community a real-life example of a green gateway. 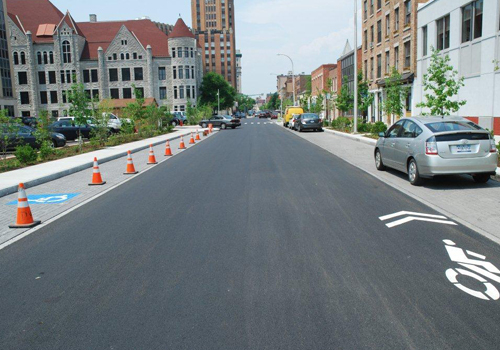 In addition to the impressive difference along the corridor, the project also illustrates collaborative efforts between the County and City of Syracuse. 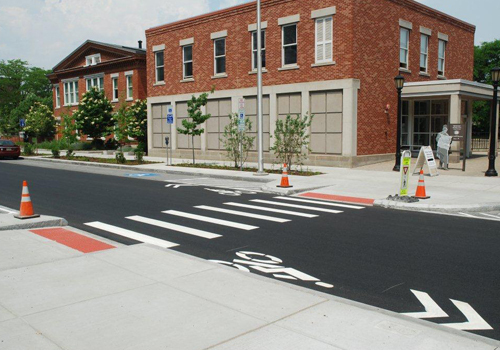 The Water Street gateway is part of a green street program strategy coordinated through a joint City/County implementation team that works closely to identify potential green infrastructure projects. Several gateway projects are planned for the Save the Rain program in the near future.